Are you looking to hire a trainer or sell your own expertise as, say, a web designer? Well look no further than Paygr, a marketplace that allows you to make money doing what you love to do. The startup, which is set to launch in 6 to 8 weeks, aims to take the best parts of PayPal, eBay, and craigslist and mash them up into something that’s useful for the average consumer looking to safely pay for goods and services offered by members of their community. 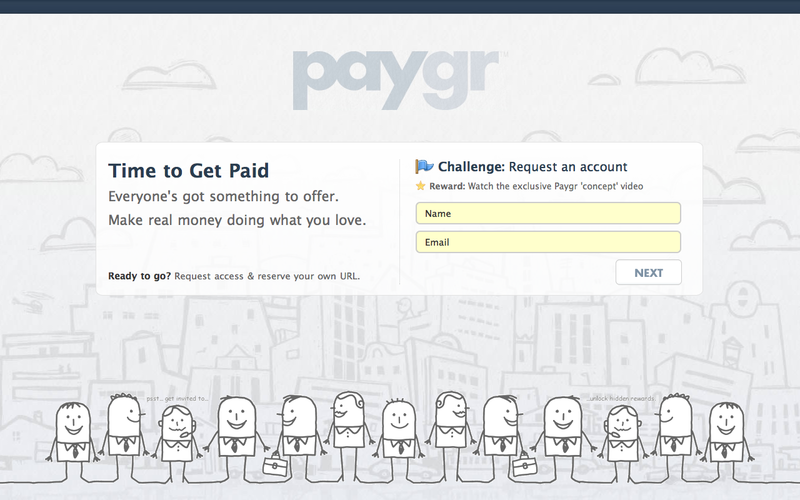 Here’s how it will work: First, you’ll go to Paygr’s homepage and sign up. If you’re a buyer, you’ll enter your query and Paygr will serve up a list of matching sellers, each of which will have reviews left by other members (Paygr’s system will pull in your social graph, allowing you to see reviews that have been left on your friends). Sellers gradually build reputations on the site, helping create a trust model. Founders Brad Damphousse and Andrew Ballester worked previously on GoFundMe, an online fundraising site, and say that their experience with GoFundMe showed them that they were “barely scratching the surface” of what was possible and that there was a big opportunity in local services. So, in September 2010, they began work on Paygr, working closely with PayPal on their API to gain insight into the backend and the best methods to offer a secure way to send and receive payments online. Building on this payment mechanism, Paygr took the basic idea behind craigslist’s “Services” and “For Sale” features and is attempting to make local transactions less anonymous and more secure. Paygr is currently boot-strapped and courting potential investors, with the hope that a viable revenue stream will come from taking a small percentage of each transaction. Damphousse said that he expects that percentage to be — like GoFundMe — somewhere in the ballpark of 5 percent. Of course, some of this may sound familiar. You may remember RedBeacon, which won the top prize at TechCrunch50 in 2009 and applied the “OpenTable model of online transactions to a broader spectrum of services.” (Sites like Gigbux, PeopleStox, Fiverr, and oDesk are also vying for a similar market.) To set itself apart from these companies, and the likes of eBay and craigslist, Paygr has their work cut out for them. Yet, seeing as the startup hopes to focus not on small business transactions or those limited to the $5 to $10 range, but transactions happening between you and, say, your neighbor at any price — so that you can get someone you can trust to feed your goldfish while you’re away on vacation — they might yet be able to distinguish Paygr from the rest of the pack. Building on the success of GoFundMe, too, will be imperative. You can go to Paygr.com and request an account starting today.